Is Russia really America’s enemy? Since 1945, the United States has justified numerous wars, interventions, and military buildups on the pretext of a Russian Red Menace, even after the Soviet Union collapsed at the end of 1991 and Russia stopped being Red. In fact, the two biggest postwar American conflicts, the Korean and Vietnam wars, were not, as many people frequently claim, about stopping Soviet aggression or even influence, but rather about maintaining old colonial relationships. Similarly, many lesser interventions and conflicts, such as those in Latin America, were also based upon an alleged Soviet threat, which was greatly overblown or nonexistent. And now, the specter of a Russian Menace has risen again in the wake of Donald Trump’s election. 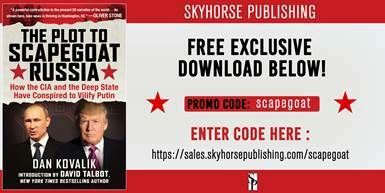 The Plot to Scapegoat Russia examines the recent proliferation of stories, usually sourced from American state actors, when they’re sourced at all, blaming and manipulating the threat of Russia. This book shows readers two key things: the ways in which the United States has needlessly provoked Russia, especially after the collapse of the USSR, thereby squandering hopes for peace and cooperation; and how Americans have lost out from this missed opportunity and from decades of conflicts based on false premises. These revelations, among others, make The Plot to Scapegoat Russia one of the timeliest reads of 2017. 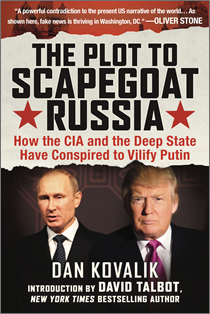 In relation to the book launch of Dan Kovalik‘s The Plot to Scapegoat Russia: How the CIA and the Deep State Conspired to Vilify Putin, Skyhorse Publishing has shared with Global Research the foreword of the book by Roger Keeran and Thomas Kenny. Click on the banner below and simply put in the promo code to download a free copy of the foreword in PDF.